An acoustic guitar album of favorite Christmas songs, plus two originals. 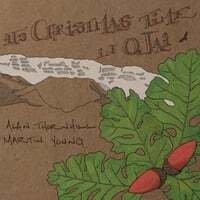 "Alan Thornhill and Martin Young have come together to create a beautiful Christmas album. The album captures the essence of the sounds of Christmas with familiar songs that have been musically woven together in an whole new and different way. Their playing styles together cast images of holly and snow with mistletoe hanging in the hall. Scents of pine and cinnamon apple cider steeping in the room. At times when listening to the music, I felt the warmth on my face while sitting around the fire at Napenthe in Big Sur in the chill of the night. But most of all, the music gave me an appreciation of my family, my children and how lucky I am to have grown up in a community like Ojai. To have and to have known such wonderful friends there; friends like Alan and Martin who create great music, and remind me that once again, It's Christmas Time in Ojai." This CD has been in constant rotation since I pulled it out of the package. It's my holiday soundtrack at home and every guest finds the playing delightful. "It's Christmas Time in Ojai" makes a great gift. I love the two original songs and am dying to learn to play them. Thankfully, Martin and Alan are no longer Ojai's best-kept secret. Now you can share them with friends and family far and wide. This album is absolutely beautiful. Alan Thornhill and Martin Young have captured the essence of classic Christmas songs and have given them a fresh breath of originality. The more you listen, the better it gets and it just keeps growing on you. Mostly instrumental with a few superb vocals, this album will brighten your Christmas!